As I mentioned last week, these movement patterns were necessary for survival in our natural habitat, long before cars, washing machines and the countless conveniences of modern life. However we also use these patterns all the time in our daily lives as I’m sure you can see, so whether you’re an athlete or not, learning to perform these patterns optimally is important. This week I’m going to focus on the Pull movement pattern through the mechanics for the Single Arm Cable Pull. Most functional pulling is done standing, often predominantly on one leg while generating force with the opposite arm. In the pull, the arm and scapula should work synergistically, beginning and ending movement together. A common error by exercise instructors is to retract the scapula adductors first, then pull with the arms. This sets up faulty timing in the musculoskeletal system, over-working the shoulder and rotator cuff muscles. A functional core is essential to provide a strong foundation for any pulling movement. Starting Position: Stand facing a cable column that has been adjusted to shoulder height. Take a split stance, with one leg forward and the other behind you (your knees should be soft and unlocked). Grab the cable handle, using the arm on the same side as the rear leg. Action: Initiate the movement with your trunk, gently draw your belly button in toward your spine and simultaneously rotate your trunk toward the rear leg while pulling the cable toward your shoulder. Keep the forearm in exact alignment with the cable throughout the movement, and do not let your elbow drop below or rise above the line of the cable. Reach along the cable with your opposite arm as you pull. Reverse this movement until you reach the starting position. Make it easier: Sit on a Swiss ball. 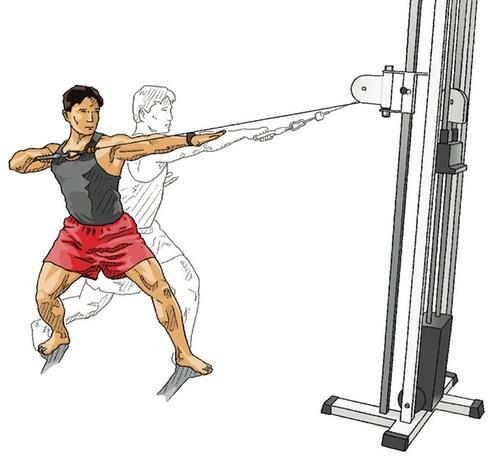 Make it harder: Pull with the same arm as the forward leg or stand on one leg and pull. Purpose: Single arm pulling strengthens key postural and stabilizer muscles and aids in mobilization of the thoracic spine (upper back). Remember, always talk to your health care provider before beginning a new training program. Perform each exercise with a moderate tempo. I’ve suggested repetitions for this exercise, but it is more important to follow the Form Principle. Only select the level of exercise that can be performed with the perfect technique and end each set before your form breaks down.